As they weigh what to do with Eli Manning's brother, there are no easy answers for the Indianapolis Colts. Come March 8, Peyton Manning is due a $28 million option bonus that will kickstart the final four years of the five-year, $90 million deal he signed last summer. That's a lot of money for a team that will likely draft Manning's replacement with the first overall pick in the upcoming draft. The Colts instead could release Manning, but then he could play somewhere else—and possibly succeed—while they get nothing in return. 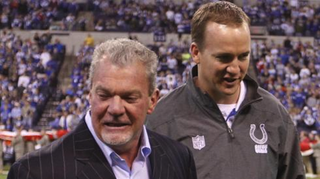 "We can make it work if he wants to be here,'' Irsay said today. "We'd be excited to have him back and finish his career with us. "There's no question it can be worked out if he wants to be here,'' said Irsay, who has concerns over Manning's long-term health. Translation: Does Manning want to play for the Colts with a restructured deal, or does he want that $28 million he likely won't get from the Colts, in which case he would have to play somewhere else. It's up to him now. I'm sure Rob Lowe will be the first to tell us what he decides.